Simon Cowell's Puffy Face Sparks Twitter Reaction: Botox or Fillers? The internet has officially exploded! On Monday night Jay Leno welcomed X-Factor judges Britney Spears and Simon Cowell to the Tonight Show. But it wasn't the actual interview that had the internet stirring. No, it was the appearance of Britain's favorite megalomaniac, Simon Cowell, that caused hundreds of tweets to flood the twittersphere. 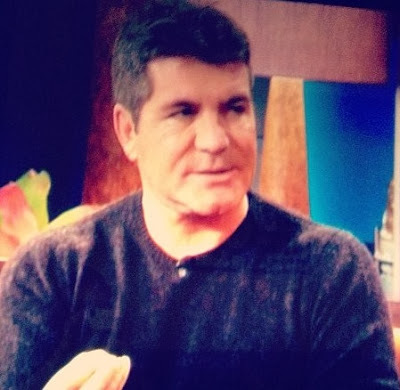 Cowell has previously admitted to using botox injections as a casual means to ward of wrinkles, but judging from his doughy facial appearance on the Tonight Show on Monday, it would seem that Cowell is also dabbling in facial fillers. A: Simon opted for Juvederm, Restylane, or a similar type of facial filler treatment. B: Mr. Cowell decided to get a last minute botox injection and didn't leave enough time for the swelling to go down before going on air. C: Simon had some type of allergic reaction, either dietary or cosmetically related. We'll leave you with a few tweets from the world of instant notoriety. Share your thoughts below!